Whenever I come across a vegetable for my garden that grows well on its own and is not attacked by a myriad of pests, I am delighted. One that I have been growing for a couple of years now and fits this category is called Zen. It is a hybrid in the genus Brassica (Mustard). Scientifically it is Brassica rapa x brassica oleracea capitata, a hybrid cross between cabbage and Oriental mustard spinach (Komatsuna). The species Brassica oleracea includes vegetables such as broccoli, kale, cauliflower and brussel sprouts. Brassica rapa includes turnups, napa cabbage, mizuna, bok choi and tatsoi. This new fast growing, mildly sweet green can be picked and enjoyed 30 days from sowing. 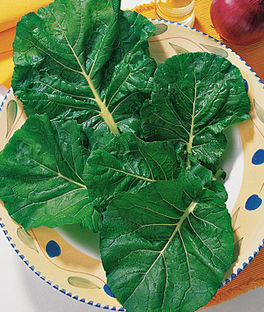 Zen resembles collard greens, but the leaves are larger and more tender, much like lettuce but with a rich, savory taste. It is an excellent source of vitamin A and C and is resistant to bolting in the summer heat. Early to harvest, zen is dependable for picking all year long in suitable climates. The leaves can be used at any stage: young leaves in salads, and large leaves used in soups, stir fry, and pickling, or simply steamed or boiled. Plants produce oblong-shaped dark green leaves with thick main stems and many side shoots. The Oriental green, zen hybrid grows as an annual but will live more than one year. The plants thrive in full sun and require water often. No wonder they grow well in tropical areas. Zen tends to grow best in a soil pH between 5.4 and 7.7. With the increase of online shopping everything from abacus to xylophones arrive in cardboard boxes. What to do with them? A simple solution combines recycling and soil nutrition and weed, slug and snail control! Cardboard boxes can be broken down and placed on the ground for excellent weed control; without sunlight the weeds will not grow. 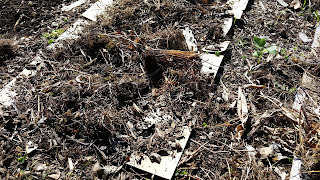 Some perennial weeds, especially those grasses with 'runner roots', although they will not grow under the cardboard, they will not be eliminated. Most gardeners know that mollusks (slugs and snails) are a major pest. They are able to destroy seedlings and devour well-established plants. Several control measures are available including chemical baits, trap boards, sanitation, even chickens and ducks. A trap board is a manageable size board, perhaps 12 inches by 12 inches, placed on the ground near slug and snail activity. Place one end of the board on a small rock, or another object in order to give it enough lift for the slugs to crawl under. This board then becomes a good hiding place for the slugs and snails which can periodically be scraped off and disposed. Under the category of trap boards, we can also utilize cardboard boxes. Simply break down all the boxes and place them in the garden in an area where slug damage is frequent; preferably in the shade, although not necessary. To escape the heat of the day, the snails and slugs will seek shelter and hide under the cardboard. Periodically, check under the boxes, collect and dispose of them. 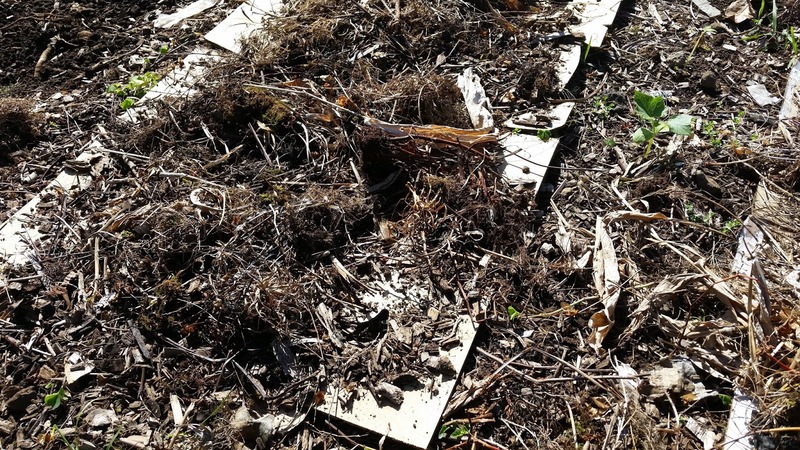 Over time, the cardboard itself will breakdown contributing toward a healthy soil. Some white fuzzy growth on the cardboard are various species of fungi which help it decompose. They will not harm the plants and are a benefit to the soil. 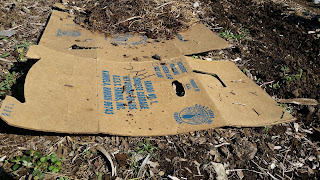 The one drawback to this method is that the boxes will not add much to the beauty of the landscape; wood chips or other organic compost can be layer on top of the cardboard. For more details on controlling slugs and snails see article at this site entitled Slugs and Snails.